I was wondering if I pay for a premium account will support help me make a custom workflow of buttons? Essentially I want to have a paypal button on my site. Once the customer has payed I would like them redirected back to a page on my site were they have the ability to upload documents. Would it be possible for your support to help me figure out a solution for this step by step? Or, will support give me knowledge base articles for me to refer to? Thanks for contacting us. You may use our Paypal and Paypal Pro Payment fields even if you have a free account as long as you have a Paypal Pro account if should you wish to use the Paypal Pro Payment. 2. Select Custom URL then click next. 3. 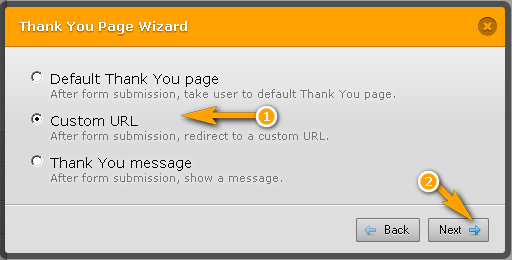 On the next window, you have to paste the URL where you would like your users to be redirected.